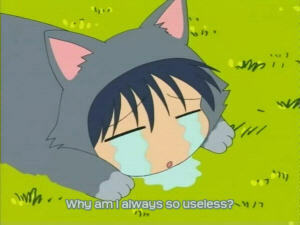 Pic of the day: "Why am I always so useless?" The NaNoWriMo-pression is settling in. It sure was early this year, normally it takes a week. More Civ4. Repeated attempts to write at novel, stalling. Wrist starting to hurt somewhat, but not as bad as earlier years. I still have plenty of painkiller left, but would rather not use it too much. There was a brief snap of cold weather around the turn of the month, but it has been fairly warm for some days now.